INSANE 55 Chevy Crash – Driver Walks AWAY!! In this fateful (and nearly fatal) dragrace at Pikes Peak International Raceway, some indication of the carnage to-come is present right from the start. No sooner do the cars launch than the Chevrolet Camaro in the far lane begins to list dangerously right and left. Amazingly, the driver of the Camaro manages to wrestle all that torque back into line and finish the race. But the 1955 Chevrolet Bel Air driver in the near lane doesn’t have quite the same level of success. Responding to the undulating proximity of the Camaro, the driver whips to the outside to avoid collision. But trying to get straight again, he over-corrects, and the car goes rolling out of control. It rolls four times before flipping up and sliding on its nose, and drops back down onto its tires. The driver’s legs lay on the bonnet, through the windshield. Considering the immensity of the crash, it’s truly astonishing to then see the driver retract his legs and free himself from the wreckage of his once-beautiful Chevy. 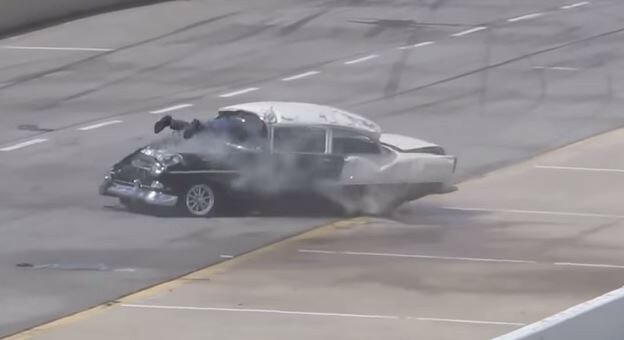 Internet comments in response to the crash, both on Youtube and in the original Speed Society post, condemn the ’55 Chevy driver for not strapping-in and for not having a cage, both of which are unfounded – and untrue. Clearly the car had a cage, or it would be flatter than a pancake. And the driver was indeed restrained by a 6-point harness, which let go at some point between the start of the race and, oh, flipping violently down the dragstrip at speed. These comments remind us that even in motorsport, people are quick to condemn without getting all the facts, if only to cite these missed steps as justification for the wreckage. At any rate, we’re ecstatic that the driver survived the crash, even though the same can’t be said for his Chevy. Watch the terror for yourself. Fair warning, you might hear some NSFW language.